With an oral examination and x-rays of the mouth, Dr. John can evaluate the position of the wisdom teeth and predict if there are present or future potential problems. Studies have shown that early evaluation and treatment result in a superior outcome for the patient. Patients are generally first evaluated in the mid-teenage years by their dentist, orthodontist, or by an oral and maxillofacial surgeon. 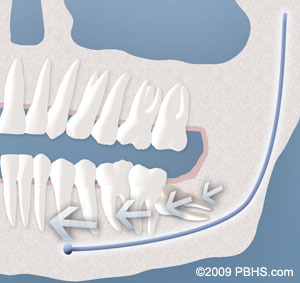 As wisdom teeth develop, the roots become longer and the jaw bone more dense. When it is necessary to remove impacted wisdom teeth in your thirties, forties or beyond, the post-operative course can be prolonged and there is a higher complication rate. Treating these complications is often more difficult and less predictable than with a younger patient. Healing may be slower and the chance of infection can be increased. 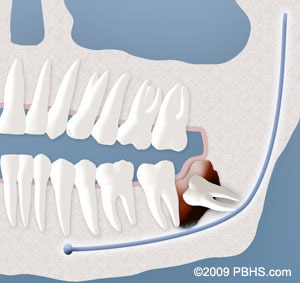 The bone does not completely fill up at the site of the extraction after the age of 30. If your impacted wisdom teeth are not removed in your teenage years or early in your twenties and they are completely impacted in bone, it may be advisable to wait until a localized problem (such as cyst formation or localized gum disease and bone loss) develops. In general, you will heal faster, more predictably and have fewer complications if treated in your teens or early twenties. On the day of your procedure, you will take medications to help minimize post-operative pain and swelling. We ask that a parent or responsible adult accompanies you to the office and plans to stay with you the rest of the day. The procedure will take about 30 to 60 minutes and you will probably be in the office for 90 minutes. Sterilization and infection control techniques are used at all times. On the morning of your surgery, it is essential that you have nothing to eat or drink (excluding prescription medications with a sip of water) for at least 8 hours. This does not mean you should try to fit in one “last meal” exactly 8 hours before your surgery. Having anything in your stomach can increase the risk for serious anesthetic complications and can also contribute to nausea and vomiting. Your procedure will be rescheduled if you have not heeded these guidelines.. When you are seated in the surgical room, we will make every effort to make you as comfortable as possible. If you are going to be sedated, we will give you Nitrous oxide first and then will place an IV usually in your right hand or arm. This is a quick and nearly painless procedure that ensures optimal delivery of your medication. Local anesthesia is given to you afterwards to ensure comfort, and allow adequate time to travel home and rest. You will be sleepy for a significant portion of the day. Once the local anesthesia wears off, you will require pain medication. Please use the regimen we suggest with non-narcotic anti-inflammatory medications. In most cases, this is enough. If the non-narcotic regimen is not sufficient, please contact the office for narcotic prescriptions. The local anesthesia may last for several hours and should not be confused with an injury to your nerve. We recommend starting your post-operative diet with clear liquids such as jello and broths, gradually increasing in substance as your body permits. The fee for your treatment is determined by a number of factors. These may include the difficulty involved in removing your teeth and which type of anesthesia is best for you. During your consultation appointment, the surgeon will need to review your x-rays, complete an examination and determine the best option for anesthesia, before an accurate estimate can be provided. Every insurance company has a different policy regarding the extent of coverage for a given surgical procedure. Our administrative staff will help you obtain maximum insurance coverage for your treatment. At the time of your consultation, your specific situation will be discussed in greater detail. We encourage you to ask any questions you may have. If new questions arise after your consultation, please call our office at Lutherville Office Phone Number 410-337-7755 to speak to one of our patient care coordinators.